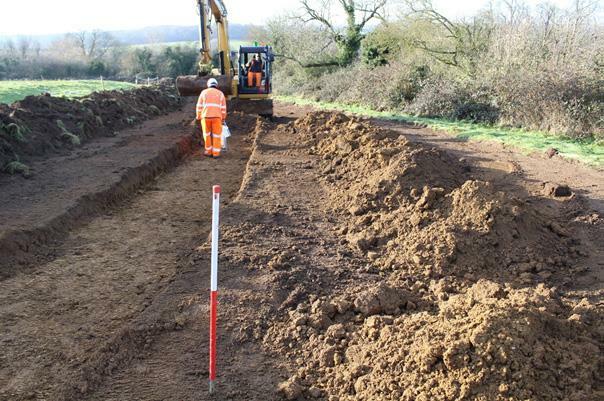 PCA Warwick undertook a programme of archaeological observation and recording during works undertaken to replace a water main across land to the west of Whittlebury, Northamptonshire. The fieldwork comprised of detailed monitoring of two designated areas of ‘open cut’ construction of the pipeline and associated compound where the route passed close to the medieval core of Whittlebury and across the projected route of a Roman road. The first area of potential archaeological interest was within the postulated extent of the early-medieval/medieval village of Whittlebury where the footprint of a temporary construction compound and the first section of the pipeline and associated easement were to be undertaken adjacent to the High Street (A413), Whittlebury. Due to the shallow nature of the intrusive works associated with the compound no features in this part of the site were excavated and instead they were planned and left in-situ. Nevertheless the remains of part of a post-medieval yard with a series of internal stone surfaces, a stone lined well, ancillary structure and a number of probable industrial pits were revealed. Additionally, a linear ditch followed the line of the natural escarpment and appeared to be the western limit of activity in the area. Further to the west in the second area of potential archaeological interest it was anticipated that the pipeline may intersect the route of a projected Romano-British road. Whilst no evidence of this road was revealed due predominately to later agricultural activities, it was noted that the projected line of the road passed through an area which would have been geologically and topographically suitable for such a route. PCA worked in accordance with the pipeline contractor’s methodologies and timetable and amended their approach to the fieldwork to ensure that the archaeological investigations were undertaken within the required parameters of the pipeline construction.